A project manager may need to look at all the projects being managed by him. ProofHub allows you to do that in just one glance. Under Managed by me tab, you will be able to see the list of projects managed by you. Also, you can click on menu icon present on right side of a project to access its context menu. Using it you can manage people present in the project, edit its details, delete a project, create its copy and check its activity logs. Managed by me tab will only be visible to those who are assigned as Manager of the projects. Click on Category filter and choose among the different categories you’ve created in your account and you’ll be able to see projects present in the selected categories. If you want to filter your projects by color, then click on Colors filter and choose any color among all and you’ll be able to see projects which have assigned the selected colors. 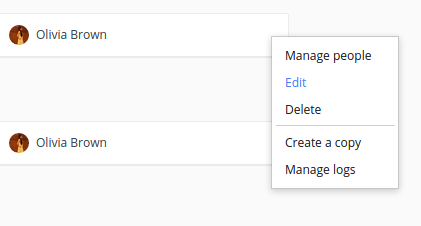 Similarly, if you select Status filter and choose Active option then it will display you all active projects managed by you. 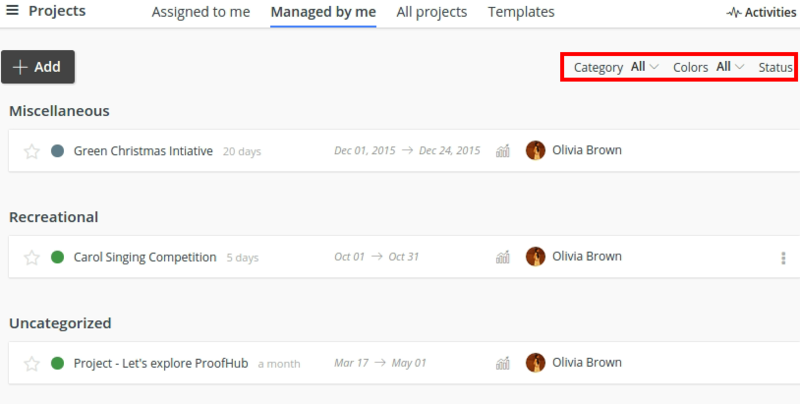 In case you choose Archive option then all archived projects will appear in list view. By default active projects will be shown.